The holidays you remember with the greatest affection are those where you made a connection with special people in a special place. That’s the kind of experience you’re guaranteed to enjoy in Samoa. Samoa has all the island beauty you could wish for, with impeccably blue lagoons and tropical greenery in all directions. But it’s the warm welcome that will linger in your memory. Samoa is the beating heart of Polynesia, where ancient traditions meet the modern world. Small wonder that Robert Louis Stevenson of Treasure Island fame found his final resting place in these beautiful islands. And you’ll find that contemporary Samoa still holds the same magical pulling-power today. This is an island ideal for active holidays or lazy beach breaks, with a wide range of adventures and serene resorts to tempt all types of traveller. Its also home to the South Pacific’s most famous festival. This is an island ideal for active holidays or lazy beach breaks, with a wide range of adventures and serene resorts to tempt all types of traveller. 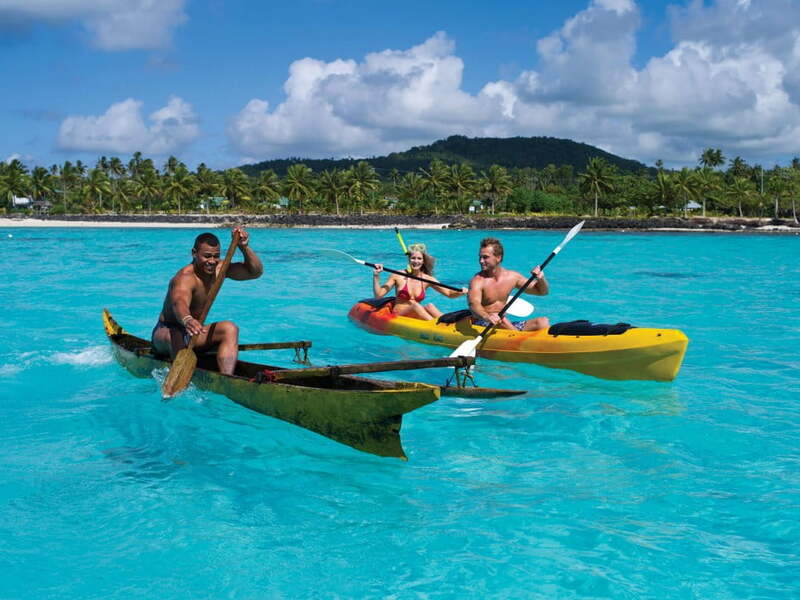 Here are some Samoan activities and adventures to whet your appetite. Go shopping in the Apia flea markets on Beach Road every day except Sunday. This is the place to pick up traditional carvings and fine cloths printed with motifs, colourful lava-lava, kava bowls and jewellery. Visit the nearby Robert Louis Stevenson Museum and Grave, where the great writer is buried on Mount Vaea overlooking Apia. Catch the ferry to Savai’i, Samoa’s larger (but less populated) island. Check out the Savai'i lava fields with Warren Jopling of Safua Tours. Plan to stay in or near the north shore village of Manase, perhaps at the Le Lagoto Resort or in an open-air beach fale beside Manase's magnificent white sands. If you’re visiting during September, don’t miss the Teuila Festival. It’s an awesome celebration of everything unique and joyful in this Pacific country. There really is something for everyone, including a choral exhibition, traditional and contemporary dance competitions, Chief's Fiafia Polynesian spectacular, Ailao Afi/Fire Knife dancing, Umu feasts, tattooing and carving demonstrations and the Miss Samoa Pageant.